"State-of-the-art design and excellent mobile version!" Get a 100% first deposit bonus up to $/€/£500 in your first week of playing! Enjoy a FREE $/€/£10 No Deposit Bonus EXCLUSIVELY for HLS players. Get 10% cash back on every purchase, up to 450 bonus credits per month! The King of slots is here! All Slots Casino is definitely the best place for online casino players that like to play 3 reel classic, 5 reel video slots, MegaSpin slots, progressive jackpot slots and more. But don’t be fooled by the name; the casino also offers plenty of other casino games. All Slots Casino was established in 2000 and it is operated by the well- respected Jackpot Factory Group. The casino is powered by the state-of-the-art Microgaming online casino software and it is registered under the jurisdiction of Malta. Jackpot Factory Group is dedicated to deliver quality gaming and excellent customer care and that is why All Slots Casino offers the best of the best. The casino is perfect for high rollers that prefer high quality game play and high limit slot games where they can bet big money and hit it big. The slots selection is pretty wide, but there are also table games, video poker and so on. Additionally, the bonus program, especially the VIP one, is pretty rewarding. The casino also offers high class security and a number of deposit options to its players. So head over to your favorite slot game, pull up your chair and get busy playing. Microgaming is one of the most recognized names in the online casino industry. 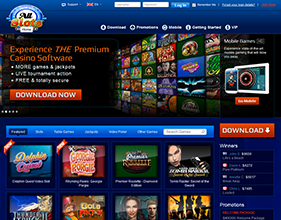 This software provider offers over 300 casino games and its quality is one of the best. Microgaming software platform powers one of the best and most reputable online casinos and All Slots Casino is one of them. To play your favorite casino game, either download the casino on your PC or try out the instant play flash version. There is no fooling around with Microgaming. The software provides vivid graphics and realistic sound effects as well as lightning fast game play. The animations of the games are superb. The flash- based games are fast to load and all games run pretty smoothly. At All Slots Casino, if you can’t find a slot you want to play, then you will probably not find it anywhere. The slots range from low, mid to high limits and players that want to play big know that they need to bet the maximum amount if they want more chances of winning and, hopefully, hit the Big One. Therefore, we suggest trying out the following popular high limit slots: Thunderstruck II, The Rat Pack, Scoop the Cash, Lucky Eggsplorer and Flight Zone. Thunderstruck II is a 5 reel, 243 pay-lines video slot based on the antics of Thor which is so popular that Microgaming decided to create a sequel. The betting range starts from $0.30 up to $0.50. The slot features wild and scatter symbol, a multiplier and free spins. The Rat Pack is a 5 reel, 10 pay-lines musically themed video slot based on Davis Jr, Martin, Sinatra, Lawford and Bishop who made up the immortal Rat Pack. You won’t see them on the reels, but you will be pleased with the great music and animations. The game comes with wild and scatter symbols and free spins. Best start as low as $0.01 up to $75.00 and the maximum win is 25,000x your bet. Based on the lifestyle of an incredibly rich aristocrat, Scoop the Cash is a 5 reel, 25 pay-lines video slot whose betting range start as little as $0.01 and goes up to $50.00. The maximum win is 15,000x your bet. The game features wild and scatter symbols, free spins and a multiplier. This chicken likes to sail away, explore the seas and hopefully come across some great prizes. Lucky Eggsplorer is a 5 reel, 30 pay-lines video slot. Bets start from $0.01 up to $75.00. The maximum win of the game is 15,000x your bet. Flight Zone is similar to Top Gun movie, containing symbols like attack helicopters, flight crew, fighter jets and more. It is 5 reel, 30 pay-lines video slot. Its betting range starts from $0.01 up to $100.00. The slot comes with wild and scatter symbols, free spins and a multiplier. All Slots Casino also offer mobile casino play and you can play a great number of slot games, including progressive jackpots, from the palm of your hand. If you are on the go, you can play high quality mobile games regardless of the time and place. Next to the wide library of slot games, the casino also offers other casino games like table games and the most popular titles include Roulette, Blackjack and Baccarat. There are a couple of versions of each table game variant and the big fish who want to deposit big can hit the high limit tables. These games are also available for mobile play. Sign up with the casino and make a deposit and you will be treated to a lucrative first deposit bonus. But this regular bonus is not the only one on offer. There is also a 10% cash back bonus on very deposit you make. With it you can earn $450 in bonus credits each month. All Slots Casino regularly updates its bonuses and promotional offers so check out the Promotions page for new offers. The casino also awards loyal players with loyalty bonuses via the All Slots Loyalty Lounge. If you bet $10, you will earn one point. With 1000 points earned, you will get ten casino credits which can easily be redeemed. The most loyal players will be invited to the VIP Longue where they will benefit from exclusive promotions. High rollers in particular will be given special bonuses tailored just for them, including customized gifts. A special customer support team will also take care for the personal needs of these players. All Slots Casino is licensed by the Lotteries and Gaming Authority of Malta. The casino uses the latest SSL encryption technology to ensure all private and personal data from players are protected and all transactions are processed in a safe and secure environment. The games have also been tested for randomness and fairness by eCOGRA. Look for the seal on the casino’s website. The customer support service is also great. If you have a question or a problem, you can contact them through phone number or request a call back. You can also write them an e-mail or if you have any immediate question, contact them via the live chat feature. Powered by Microgaming, All Slots Casino offers high quality software and casino games, top notch security and great customer service. High rollers in particular would love to try out the high limit games and hit it big as well as boost their bankroll with the many bonuses on offer. They would also like the special treatment they will get as a VIP.